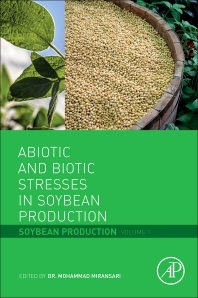 Abiotic and Biotic Stresses in Soybean Production: Soybean Production Volume One presents the important results of research in both field and greenhouse conditions that guide readers to effectively manage the chemical, physical, and biological factors that can put soybean production at risk. Including the latest in genetics, signaling, and biotechnology, the book identifies these types of stresses, their causes, and means of avoiding, then addresses existing stresses to provide a comprehensive overview of key production yield factors. By presenting important insights into the historical and emerging uses for soybean, the book educates readers on the factors for consideration as new uses are developed. It is an ideal complement to volume two, Environmental Stress Conditions in Soybean Production, that work together to provide valuable insights into crop protection. Researchers, academicians and scientists in plant biology, plant physiology, plant molecular biology, crop production, plant-microbe interactions, microbiology, biotechnology, environment, etc. It is also of special significance to the industry sector, as the production and processing of soybean grains for food and oil production is an important process. Advanced level students in these areas. B. japonicum, or N fertilization, or both? Prof. Dr. Mohammad Miransari, with 60 ISI article, 18 authored and edited book, and 38 book chapters, have been the reviewer for more than 20 international journals. I have spent a long time studying and doing research in some of the most prestigious universities in the world including Isfahan University of Technology, Isfahan, Iran, McGill University, Quebec, Canada, and Tarbiat Modares University, Tehran, Iran. At present I am the CEO of Abtinberkeh Ltd. Company, co.Abtinberkeh1.com, located in Isfahan, Iran, with the specialty of producing book and other scientific products. The presented book is a collection of research and experience by some of the best in the field of soybean.